Aderisci anche tu alla prima "Campagna in sostegno dell'immagine verace"!! 1 Beat the egg and sugar well in a mixer. Add the jam, sift flour, bicarbonate of soda, baking powder and salt. Melt the butter add the vinegar and milk. Add liquids to egg mixture alternately with the flour. Beat well and bake in a COVERED dish such as Corel at 350F for 45 minute to 1 hour. 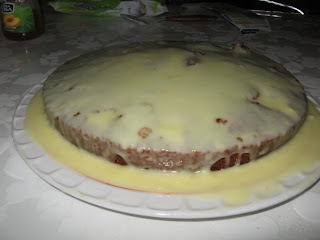 It is important to use a covered dish otherwise the sauce won't soak into cake. 2 Melt together the ingredients for the sauce and pour over the pudding as it comes out of the oven. 3 You will not beleive the taste! I never add whipping cream or Cool whip as it is quite rich the way it is.